In some situations, you have to be able to capture accurate voice recordings on the go. Whether you work as a reporter, want to record lectures, or simply want the ability to capture ambient sounds, the right tool for the job is a portable digital voice recorder. When you’re depending on the recordings you make, though, you have to be confident that the product you choose to record and save them is capable of doing a good job. The last thing you need is to believe you’re getting the recording you need only to find that the sound is poor or – worse yet – that it didn’t record at all. We’ve taken the guesswork out of it for you by trying out a bunch of digital voice recorders and choosing the 10 best for 2018. Before we reveal them, let’s talk about some of the features you may want to consider before making a purchase. 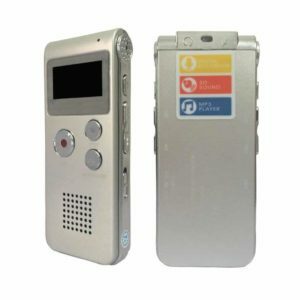 There are a lot of portable digital voice recorders on the market, and you don’t want to waste your money by buying one that doesn’t suit your needs. Here are some of the key considerations to keep in mind. The first issue to consider is the recording time. Most manufacturers will list the highest possible time, but you need to keep in mind that the higher the quality of the recording you make, the less time you will be able to record. The next issue is storage. Most digital recorders come with a memory card. However, if you need the ability to make long, high-quality recordings, you may need to invest in an extra card to make sure you have the storage you need. It’s also important to consider the recording features of the product you choose. For example, some recorders have voice activation so they will stop (and preserve battery life) when it is quiet, and restart automatically when you begin talking again. The weight of your digital recorder matters, particularly if you’ll be carrying it around all day long or walking a long distance with it. Most digital recorders are fairly lightweight, but if you’re carrying a heavy load even a few extra ounces can make a difference. Finally, you need to consider the price. As you might expect, many of the recorders with a high price tag attached also deliver superior quality to the bargain options. As you read through our list, keep these things in mind. In the end, you’ll have to weigh the various options and features to determine which recorder is right for you. 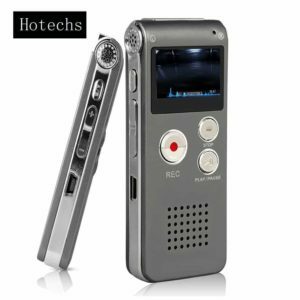 The #10 pick on our list is the Digital Audio Voice Recorder from Hotechs. We chose it because while it’s not the highest quality recorder available, it delivers a lot of good features at a low price point. It weighs only a little over three ounces. The LCD display makes it easy to use. Basic recording allows for pausing a recording to automatically restart where you left off, and there’s also a timing feature to start recording on a schedule. This recorder will play MP3 files, too. There are two potential downsides to consider. First, if you hit the stop button only once, the recorder will not save your recording. Hit it twice and you’ll see a display telling you that it’s saved. Second, you can’t do anything with your file on the recorder other than rewind to the beginning. If you want to review it or edit it you’ll have to download it onto your computer first. On the whole, though, this recorder offers good quality at a very reasonable price. 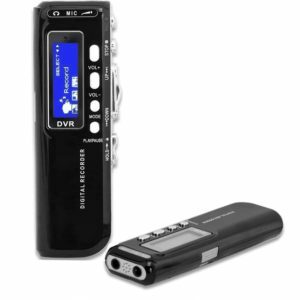 Our #9 pick is the Digital Voice Recorder with Stereo Microphones from YouThink. We chose it for its high-level functionality. The omni-directional built-in speakers allow for stereo recording in any situation, even those with a lot of background noise. It has one-touch recording and is voice activated. It works both in person and on the telephone, and the included USB cable can be used to transfer files to your computer. The internal memory card holds 8GB of recording. As you might expect, there are some potential issues. The first is that if you want a high-quality recording the battery life is nowhere near what the manufacturer claims. (They say 22 hours, you can probably expect less than half of that.) The second issue is that the manual is poorly written and a bit difficult to understand. You’ll probably have to engage in some trial and error to figure out the controls, but once you do, it works well. Coming in at #8 on our list is the MonoDeal Digital Portable Voice Recorder. We picked it because we like its dual recording modes and stereo speakers, which deliver good quality recording in a variety of situations. It records sounds as WAV files, but you can play them back as MP3, WMA, ADPCN, or WAV files. It’s extremely light at only about an ounce, and it’s very easy to transfer files using the included USB cord. On the downside, this unit doesn’t get the battery life the manufacturer claims – they say 20 hours, but you should expect about half that. The display is very small and may be difficult for some people to read. And finally, there is a slight delay between when you press the record button and when it starts recording, so if you’re not prepared you might miss a few things. 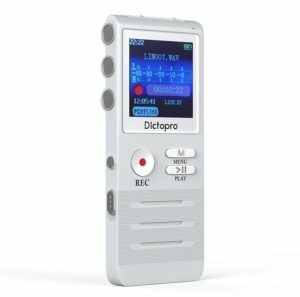 The #7 pick on our list is the Digital Voice Activated Recorder by Dictopro. We like this recorder because its two sensitive microphones have noise-cancellingtechnology to help improve the quality of your recordings. It’s quite portable, weighing in at just 5.6 ounces, and small enough to fit in the palm of your hand. The voice-activated recording method and easy file transfer make this a good choice for most people. There are a few potential cons to consider. The first is that this unit has a higher price than some of the others on this list, although we think the price is offset by the quality. While you can play back a recording on the device, it won’t allow you to rewind or fast forward, which can be a hassle if you can’t get to a computer to transfer the file right away. However, this is a sturdily made recorder that is a good choice for students and professionals. 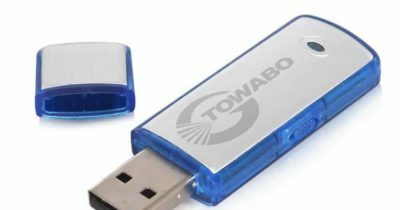 Coming in at #6 on our list is the TOWABO 2 in 1 Voice Recorder. This device makes our list because it’s both cool and efficient. It weighs less than an ounce and it looks just like an external flash drive, allowing for unobtrusive recording in any situation. Its speakers are strong enough to pick up low volume conversations even if you have it tucked in your pocket, and it’s got a pretty impressive battery life of 8 hours. There are some potential issues to keep in mind. The first is that there is a 10-second delay before it starts recording and there’s no voice-activated option. The second is that will only make WAV files which take up more space than some of the other file formats. The instruction manual could be clearer, but this is a great little recorder for the price. 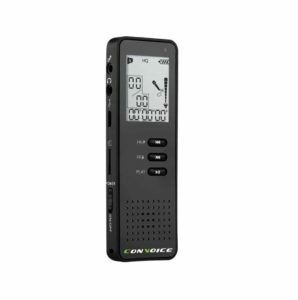 The #5 pick on our list is the Convoice Portable Digital Voice Recorder. The reason we chose this recorder is that it supports several file formats, including HQ/MP3 and SP/WAV files. It has 8 GB of built-in memory, but it can support the addition of a 32 GB card to extend its storage capacity. The recorder is voice activated, and weighs just 2.2 ounces. There are some things that could be better. The first is that if you want to record WAV files, you can expect the battery life to be only about 8 hours as opposed to approximately 22 for HQ and MP3 files. Second, it does tend to pick up some unwanted background noises such as air conditioners and things like that. However, on the whole this is a good quality recorder that should work for most people. Our #4 pick is the eBoTrade Digital Audio Voice Recorder. We chose it because it’s extremely affordable and does a good job of picking up voices even at a distance. It’s a great choice if you want your recording to be unobtrusive – small enough to fit in the palm of your hand and it weighs just 2 ounces. The built-in lithium ion batteries are rechargeable, and you can store 200 hours of recordings on it before you need to delete or transfer the files. On the downside, this recorder comes with instructions that are so tiny that they’re likely to be difficult for many people to read. That’s an inconvenience, but you can remedy it by using a magnifying glass. The good news is that once you do read them, this recorder is very easy to use. 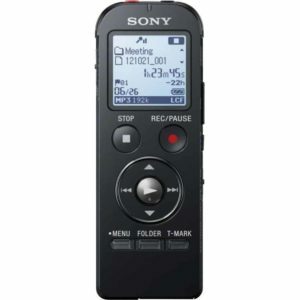 The #3 pick on our list is from Sony, the Sony ICD-PX400 Stereo IC Digital Voice Recorder. Sony is a well-known brand, and they’ve delivered a high-quality product. We like it for a lot of reasons, but we’re particularly fond of the Intelligent Noise Cut feature, which screens out ambient noise and helps ensure that you get high-quality recordings. 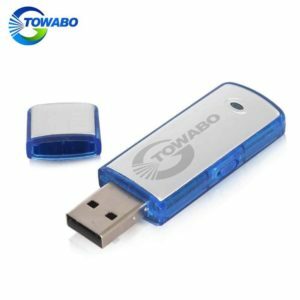 You can use the audio settings to tweak the sound quality to your liking, and the retractable USB port makes transferring files very easy whether you use a PC or a Mac. There are two potential negatives to consider here. First, this is a very small unit and it can be hard to hold onto. Fortunately, it’s sturdily built so it will likely survive a fall unless it’s a very long one. Second, this product has only 4 GB of built-in storage, which is low compared to some of the other products on our list. 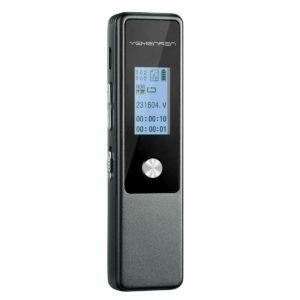 Our #2 pick is the Digital Voice Recorder by Yemenren. We chose it because of its ability to produce crystal clear recordings with its 3072 Kbps of resolution. It can even pick up conversations from 50 feet away. It’s got a sleek design that’s both lightweight and durable. It allows for easy A/B repeat during playback of files. The voice-activated recording feature means that you can set it and forget it, and it’s tiny enough to fit in the palm of your hand. Now let’s review potential downsides. There aren’t many, but one thing to keep in mind is that the sensitivity of the microphones can sometimes be a problem. For example, if someone talks behind you in a lecture or a loud train goes by, those things will end up on your recording. 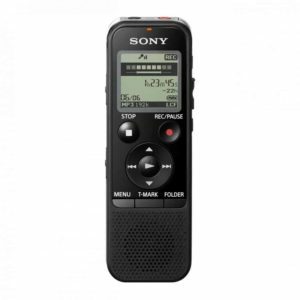 Finally, our top pick is another Sony product, the ICD-US522BLK Digital Voice Recorder. We chose it for the number one spot because it records great quality sound with stereo speakers and it’s easy and intuitive to use. It can record for up to 24 hours on a single charge, and the built in USB cord means that you’ll can transfer files easily. There isn’t much not to like here, but the two primary issues we should mention is that the built-in memory card is only 4 GB, and the price is higher than some others on our list. On the whole, though, it’s a lightweight, easy-to-use, and effective machine. Whether you’re looking for a digital voice recorder to use at work, at school, or just to keep track of your thoughts, the ten recorders on this list have the features and functionality you need.